Yogyakarta, most commonly referred to as Jogja or Yogya, is known as Indonesia’s cultural capital, and also home to a lot of art and tradition still very present in today’s culture. Yogyakarta is also the only city where a sultan lives and is recognised by the government. 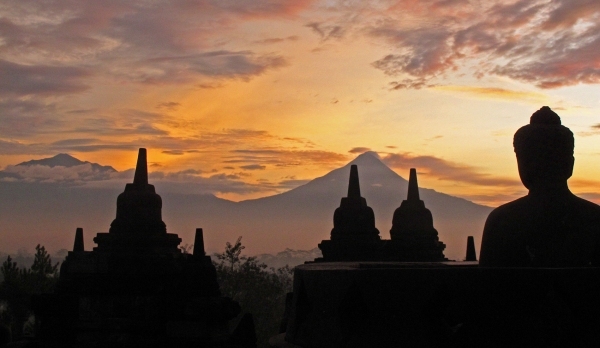 Let’s start by introducing you to Borobudur temple, the most visited attraction in Indonesia. Located on a hilltop overlooking green jungle, and facing the active volcano Merapi, the world biggest Buddhist temple is usually visited during the sunrise while climbing the magnificent temple still shrouded in the myst. Wake up early in the morning around 4AM, but it will all be worth it. You will discover the beauty and mysticism of this temple, and understand the reason of its popularity. We highly recommend that you visit Borobudur with a guide to hear about its legend and inspiring stories. Another part of the city seats the largest Hindus temple, Prambanan. This is a testament of how these two religions were harmoniously present since its past . If you are planning to visit Prambanan temple, you might come there around the sunset time. After catching the sunset in Prambanan temple, it’s a not complete experience if Ramayana Ballet Show is not on the list of things to do. Apart from these, there are several ancient temples in and around Yogyakarta that are well worth to visit such as Sewu temple, Ratu Boko palace, Mendut temple, Kalasan Temple, plaosan temple and many more. Yogyakarta is a unique provincial government as it is the only province in Indonesia where the government is lead by the Sultan who is also the King of Yogyakarta Palace. Yogyakarta Palace (kraton) still exists until today and is functioned as the residence of sultan and his family as well as hundreds of abdi dalem (the servant of the palace) who faithfully serve the palace voluntarily and run the tradition in the midst of changing times. At the palace, there are many cultural performances such as wayang kulit (puppet shadow play), gamelan (Javanese orchestra), and Javanese dance etc. All travelers will be accompanied by a local guide who amazingly can speak all kinds of language, and you will enjoyable as you listen to myths, rituals, stories and even humor as you go along the palace grounds. Indeed a must visit to understand the deep rich history and culture of Yogyakarta. You can also enjoy some sports and adventure activities that challenge you such as see the sunrise trekking at the mount Merapi, jeep ride adventure around the mountain, cycling, rafting, cave tubing, paragliding at south beach and explore the treasure of vertical Jomblang cave. You could have unique photographs that you've taken during some adventure activities. Not to mention when you're uploading some of your adventure photographs on social network, people will get jealous and curious about your unusual and unique adventure trip. Yogyakarta has plenty of shopping destinations and you will find everything from local markets to sophisticated malls. Get the best deals along the shopping streets of Malioboro, the cheap shopping area in the heart of Yogya! From bags, shirts, and more souvenir items, they have it all here! Price items from small store halls and street vendors doesn’t differ that much. Parade of street foods can also be found along the way. Best way to explore the streets is by foot, just within walking distance from Stasiun Tugu (Tugu Railway Station). Another option is hiring a becak (pedicab) or the ubiquitous four-wheeled horse-drawn carts called “andong”. Beringharjo market becomes part of Malioboro that is worth visiting. You will find lots of stalls line up selling anything you can think of from clothes to bags to rattan products and silver jewelries, food and anything you thought you might find in Indonesia. What a best way to end your trip in Yogya by getting real good cheap souvenirs in Malioboro, one of the best places to visit in Yogyakarta, Indonesia! As you may know, each region of Indonesia has its own special delicay. In Jogja, the most wanted dish is the Gudeg, tasting very distincly from any other Indonesian dishes. Gudeg is made of Jack fruit cooked with coconut milk and spices, which gives it a sweet and spicy taste as you can guess. In addition, it is usually prepared with cow skin, egg, soya cake, and chicken, definitely a must eat in Yogyakarta! You may go to Gudeg Bu Tjitro on Janti street or at Gudeg center in the area of Wijilan. You can however find it in many places, or ask a local that you meet during your trip to give you a good address. In the southern part of Yogyakarta, you will find many beaches. The most famous beach is Parangtritis with its legendary figure of Nyi Roro Kidul (Queen of the South). There are many activity you can do while watching sunset that would be incomplete if you haven't set aside a little of your time to watch the sun sets behind the horizon. Yogyakarta has also many natural beautiful beaches in Gunungkidul such as Baron beach. Krakal beach, Indrayanti beach, Pok Tunggal beach and many more that offers beautiful white sand beach colliding with south sea waves will become drama where the bright blue sky turns to golden orange. For Adventure lovers, you can also visit Siung Beach Beach which has 250 channels of rock climbing. The Cavinton Hotel Yogyakarta is ideal for active and spirited travellers who love to experience to do some adventure activity and explore the heritage building & culture of this city. Located in center of Yogyakarta, the hotel stands a short distance from the souvenir paradise of Malioboro shopping district, and the Sultan’s Palace complex including the gorgeous Taman Sari Water Castle.